Once an avid Twitter user, Steph Chandler Burns almost never uses the social networking site anymore. 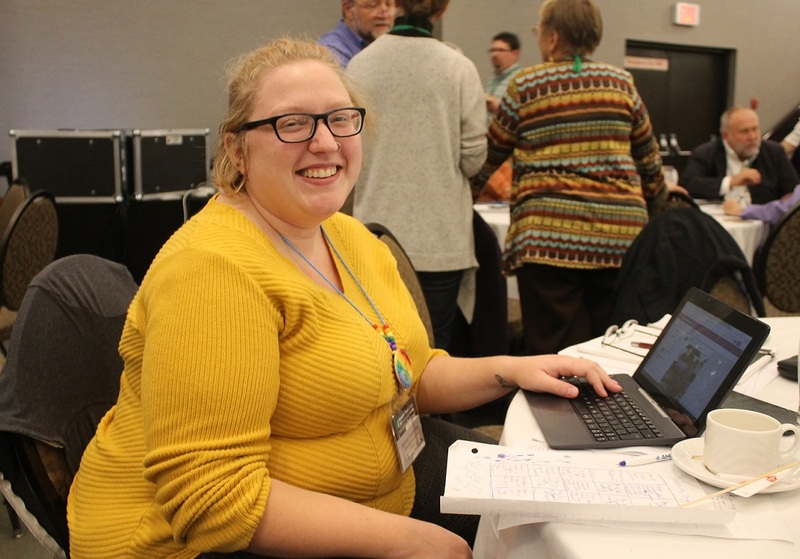 That changed, however, when she attended Mennonite Church Canada’s Special Delegate Assembly in Winnipeg Oct. 13-15, 2017. 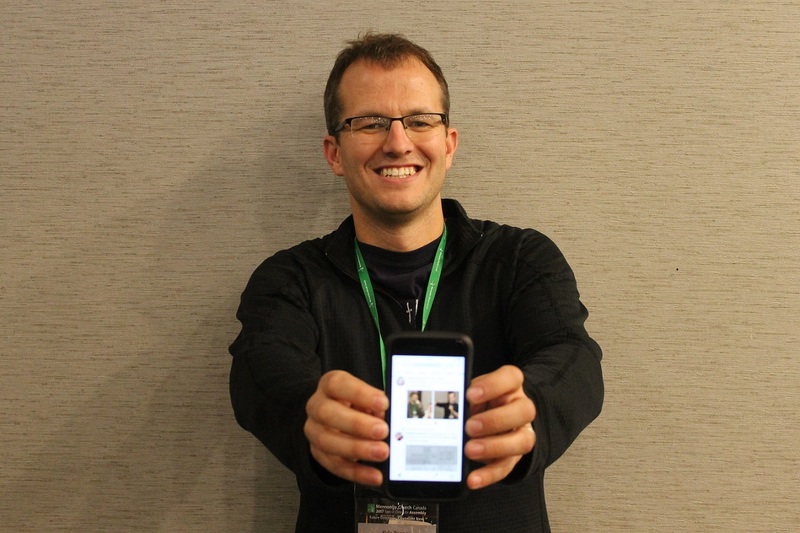 Chandler Burns, interim pastor at Bloomingdale Mennonite Church in Bloomingdale, Ont., was one of more than 15 delegates who were tweeting throughout the assembly, using the hashtag #mcassembly2017 to share their thoughts online. One of the key reasons she tweeted at assembly, Chandler Burns said, is so that she could report in real-time what was happening to people who could not be at assembly. Between five and ten of Chandler Burns’ friends who weren’t at assembly were following her tweets. A few expressed their appreciation to her via text, and one friend sent her a message on Twitter asking for documents related to assembly so that he could do more research. Kyle Penner, associate pastor at Grace Mennonite Church in Steinbach, Man., was tweeting throughout assembly for similar reasons as Chandler Burns. “You do it to connect with people who aren’t at your table [and] you do it for the diaspora of people who aren’t here,” said Penner, 34. Penner was one of the more prolific tweeters at assembly, and his posts ranged from heartfelt expressions to GIFs that gently poked fun at assembly proceedings. During Saturday morning’s business sessions, when the discussion turned to amendments to the bylaw to restructure MC Canada, Penner was one of a handful of delegates tweeting funny comments. “It’s a humorous way to interact with content that… at times can be less than engaging,” he said. 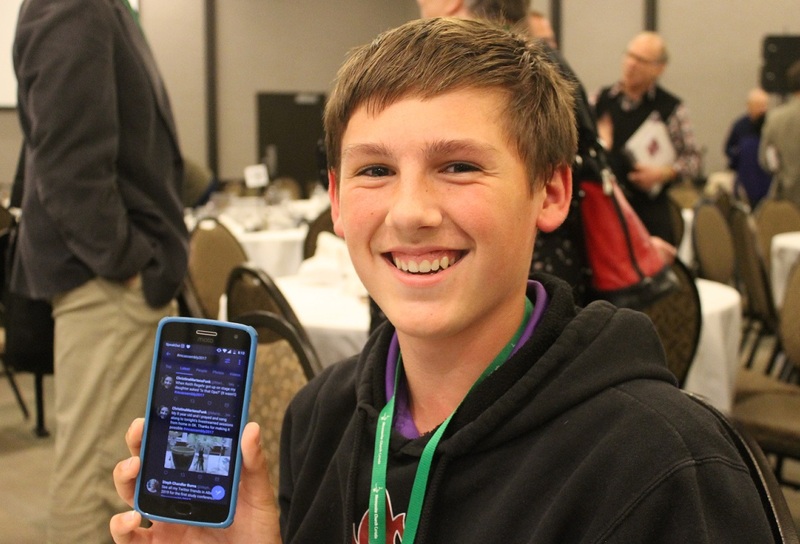 Micah Neufeld, a youth delegate from Stirling Avenue Mennonite Church in Kitchener, Ont., joined Twitter during assembly. It was the 14-year-old’s first time attending a gathering of the nationwide church, and he said checking the #mcassembly2017 hashtag from time to time to see what people were saying enhanced his assembly experience. Nothing like breaking into song at #mcassembly2017 to restart after a quick break. She discovered this while tweeting at the MC Canada Assembly in Saskatoon in July 2016. “As I was trying to follow along and tweet things as they happened, it actually helped me pay better attention to what was going on,” she said. Those notes can come in handy later when interacting with people in your home congregation, Chandler Burns added. “It’s a good way for being able to report back,” she said. Tweets about MC Canada’s Special Assembly can be found on Twitter with the hashtag #mcassembly2017. Thanks to all the people on twitter for making this better. Thanks to everyone who had to scroll through a ridiculous number of gifs.